An ion-exchange resin or ion-exchange polymer is an insoluble matrix (or support structure) normally in the form of small (0.5-1 mm diameter) beads, usually white or yellowish, fabricated from an organic polymer substrate. The beads are typically porous, providing a high surface area. The trapping of ions occurs with concomitant releasing of other ions; thus, the process is called ion-exchange. There are multiple types of ion-exchange resin. Most commercial resins are made of polystyrene sulfonate. Ion-exchange resins are widely used in different separation, purification, and decontamination processes. The most common examples are water softening and water purification. In many cases, ion-exchange resins were introduced in such processes as a more flexible alternative to the use of natural or artificial zeolites. Also, ion exchange resins are highly effective in the biodiesel filtration process. During the era of the squeegee, any window cleaner that left runs or streaks was also branded ‘a bad window cleaner’ and no fault was attributed to the tools of the trade. Most typical ion-exchange resins are based on crosslinked polystyrene. The actual ion exchanging sites are introduced after polymerisation. Additionally, in the case of polystyrene, crosslinking is introduced via copolymerisation of styrene and a few percent of divinylbenzene (non-crosslinked polymers are soluble in water). Crosslinking decreases ion-exchange capacity of the resin and prolongs the time needed to accomplish the ion exchange processes but improves the robustness of the resin. Particle size also influences the resin parameters; smaller particles have larger outer surface, but cause larger head loss in the column processes. Besides being made as bead-shaped materials, ion exchange resins are produced as membranes. The membranes, which are made of highly cross-linked ion exchange resins that allow passage of ions, but not of water, are used for electrodialysis. Strongly acidic, typically featuring sulfonic acid groups, e.g. sodium polystyrene sulfonate or polyAMPS. Weakly acidic, typically featuring carboxylic acid groups. Weakly base, typically featuring primary, secondary, and/or ternary amino groups, e.g. polyethylene amine. Anion resins and cation resins are the two most common resins used in the ion exchange process. While anion resins attract negatively charged ions, cation resins attract positively charged ions. Anion resins may be either strongly or weakly basic. Strongly basic anion resins maintain their positive charge across a wide pH range, whereas weakly basic anion resins are neutralized at higher pHs. Weakly basic resins do not maintain their charge at a high pH because they undergo deprotonation. They do, however, offer excellent mechanical and chemical stability. This, combined with a high rate of ion exchange, make ‘Weakly’ base anion resins well suited for the organic salts. For anion resins, regeneration typically involves treatment of the resin with a strongly basic solution, e.g. aqueous sodium hydroxide. During regeneration, the regenerant chemical is passed through the resin and trapped negative ions are flushed out, renewing the resins’ exchange capacity. Ion exchange resins are typically produced as small beads fabricated from a polymeric material (usually polystyrene or [less frequently] acrylic polymers). During the polymerization process, styrene is combined with divinylbenzene (DVB) to form a crosslinked polymer; this crosslinking process results in increased stability when compared to non-crosslinked materials. Active groups are added to the resin after the polymerization process to determine the type of desirable ion exchange. Each copolymer resin bead possesses a gel-like structure and is able to expand and contract in liquids; they also contain numerous surface pores for trapping ions. Ion exchange resins are primarily used as integral parts in the water treatment process in both consumer and industrial settings. Water softening systems use resins to replace magnesium and calcium — two common elements of hard water — with sodium molecules. Resins can also be used to purify water by replacing metals such as copper, cadmium, and lead with benign sodium or potassium molecules. Ion exchange resins are non-hazardous. The material safety data sheet indicates that standard ion exchange resins have a zero rating for toxicity, fire, and reactivity. This only applies to new or uncontaminated resins. Materials that are collected on the resin beads during service can change the hazard rating of the material. For example, if a resin was used to remove heavy metals from a waste water stream, it would then be considered a hazardous or toxic material. It is imperative that you check with the proper authorities before disposing of resin that may have been in contact with heavy metals or other hazardous materials. Ion exchange resins that are used to process tap water or potable water sources are normally only in contact with non- hazardous dissolved solids, such as hardness, alkalinity, and others. These resins can be disposed of as ordinary trash. Check first! Resins should be disposed of in their exhausted or salt form. This may require contacting the bed with several bed volumes of dilute (5-15%) sodium chloride. Otherwise, cation resins in the hydrogen form may have too low a pH for disposal and anion resins in the hydroxide form may have too high a pH. The terms ion exchange, deionization and demineralization are often used synonymously to refer to the same process. However, deionization and demineralization may be accomplished by technologies other than ion exchange (see reverse osmosis). Ion exchange is a process used extensively in nuclear facilities, industrial processes and medical and pharmaceutical operations to control the purity and pH of water by removing undesirable ions and replacing them with acceptable ones. Specifically, it is the exchange of ions between a solid substance (called a resin) and an aqueous solution, typically municipal, potable water but it frequently involves process or even waste water (e.g., the plating industry). Depending on the identity of the ions that a resin releases to the water, the process may result in water purification or in control of the concentration of a particular ion in a solution. An ion exchange is the reversible exchange of ions between a liquid and a solid. There are two general types of ion exchange resins: those that exchange positive ions, called cation exchange resins, and those that exchange negative ions, called anion exchange resins. A cation is an ion with a positive charge. Common cations include Ca+2, Mg+2, Fe+2, and H+1. A cation resin is one that exchanges positive ions. An anion is an ion with a negative charge. Common anions include Cl-1, SO4-2, and OH-1 . An anion resin is one that exchanges negative ions. Chemically, both types are similar and belong to a group of compounds called polymers, which are extremely large molecules that are formed by the combination of many molecules of one or two compounds in a repeating structure that produces long chains. A demineralizer is a vessel, usually with a volume of several cubic feet, that contains the resin. A demineralizer may contain an intimate mixture of both cation exchange resins and anion exchange resins and is called a mixed bed. Two-bed demineralizers have two vessels, the first containing cation resin followed by a separate vessel containing anion resin. The ion exchange resin is contained in a vessel with a volume of several cubic feet. Retention elements at the top and bottom consist of screens, slotted cylinders, or other suitable devices with openings smaller than the resin beads to prevent the resin from escaping from the vessel. When the resin bed is a uniform mixture of cation and anion resins in a volume (typically in a ratio of 2 parts cation resin to 3 parts anion resin). This arrangement is called a mixed-bed resin, as opposed to an arrangement of cation and anion resins in discrete layers or separate vessels. The exchanger R in the sodium ion form is able to exchange for calcium and thus, to remove calcium from hard water and replace it with an equivalent quantity of sodium. 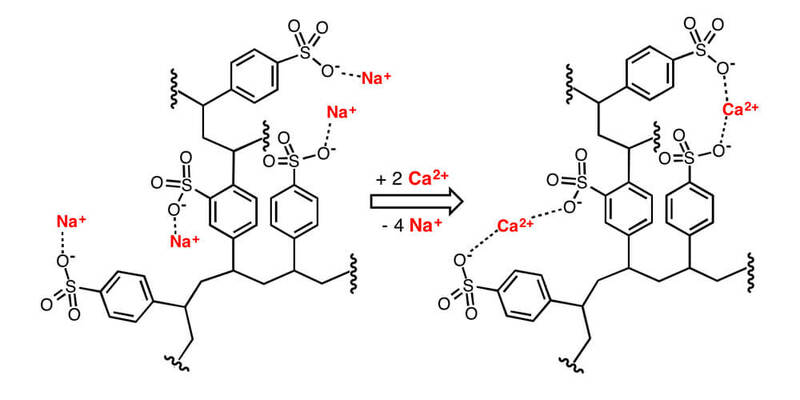 Subsequently, the calcium loaded resin may be treated with a sodium chloride solution, regenerating it back to the sodium form, so that it is ready for another cycle of operation. The regeneration reaction is reversible; the ion exchanger is not permanently changed. Millions of liters of water may be softened per cubic meter of resin during an operating period of many years. Ion exchange occurs in a variety of substances and it has been used on an industrial basis since circa 1910 with the introduction of water softening using natural and later, synthetic zeolites. Sulfonated coal, developed for industrial water treatment, was the first ion exchange material that was stable at low pH. The introduction of synthetic organic ion exchange resins in 1935 resulted from the synthesis of phenolic condensation products containing either sulfonic or amine groups which could be used for the reversible exchange of cations or anions. A variety of functional groups have been added to the condensation or addition polymers used as the backbone structures. Porosity and particle size have been controlled by conditions of polymerization and uniform particle size manufacturing technology. Physical and chemical stability have been modified and improved. As a result of these advances, the inorganic exchangers (mineral, greensand and zeolites) have been almost completely displaced by the resinous types except for some analytical and specialized applications. Synthetic zeolites are still used as molecular sieves. Conventional ion exchange resins consists of a cross-linked polymer matrix with a relatively uniform distribution of ion-active sites throughout the structure. A cation exchange resin with a negatively charged matrix and exchangeable positive ions (cations) is shown in Figure 1. Ion exchange materials are sold as spheres or sometimes granules with a specific size and uniformity to meet the needs of a particular application. The majority are prepared in spherical (bead) form, either as conventional resin with a polydispersed particle size distribution from about 0.3 mm to 1.2 mm (50-16 mesh) or as uniform particle sized (UPS) resin with all beads in a narrow particle size range. In the water- swollen state, ion exchange resins typically show a specific gravity of 1.1-1.5. The bulk density as installed in a column includes a normal 35-40 percent voids volume for a spherical product. Bulk densities in the range of 560-960 g/l (35-60 lb/ft 3 ) are typical for wet resinous products. Capacity. Ion exchange capacity may be expressed in a number of ways. Total capacity, i.e., the total number of sites available for exchange, is normally determined after converting the resin by chemical regeneration techniques to a given ionic form. The ion is then chemically removed from a measured quantity of the resin and quantitatively determined in solution by conventional analytical methods. Total capacity is expressed on a dry weight, wet weight or wet volume Figure 1. Cation Exchange Resin Schematic Showing Negatively Charged Matrix and Exchangeable Positive Ions basis. The water uptake of a resin and therefore its wet weight and wet volume capacities are dependent an the nature of the polymer backbone as well as an the environment in which the sample is placed. Operating capacity is a measure of the useful performance obtained with the ion exchange material when it is operating in a column under a prescribed set of conditions. It is dependent on a number of factors including the inherent (total) capacity of the resin, the level of regeneration, the composition of solution treated, the flow rates through the column, temperature, particle size and distribution. An example is shown in Figure 3 for the case of water softening with a standard sulfonic resin at several regenerant levels. Swelling. Water swelling of an ion exchanger is primarily a hydration of the fixed ionic groups and increases with an increase in capacity to the limits imposed by the polymer network. Resin volumes change with conversion to ionic forms of differing degrees of hydration; thus, for a cation exchanger, there is a volume change with the monovalent ion species, Li + > Na + > K + > Cs + > Ag + . With polyvalent ions, hydration is reduced by the cross-linking action; therefore, Na + > Ca2 + > Al 3+ . In more concentrated solutions, less water is taken up owing to greater osmotic pressure. Selectivity. Ion exchange reactions are reversible. By contacting a resin with an excess of electrolyte (B + in the following reaction), the resin can be converted entirely to the desired salt form: RA + + B + ! RB + +A + However, with a limited quantity of B + in batch contact, a reproducible equilibrium is established which is dependent an the proportions of A + and B + and on the selectivity of the Figure 2. Total Capacity vs. Cross-Linkage (Percent DVB) Polystyrene Sulfonic Acid Resin, H + Form Figure 3. Operating Capacity vs. Regenerant Level for Sodium-Cycle Operation, Sulfonic Acid Resin resin. The selectivity coefficient, K B A , for this reaction is given by: where m and refer to ionic concentrations in solution and resin phase, respectively. Resin selectivity coefficients have been determined for a range of ionic species and related to H + for cations and OH – for anions, which are assigned selectivity values of 1.00. Kinetics. The speed with which ion exchange takes place. The ion exchange process involves diffusion through the film of solution that is in close contact with the resins and diffusion within the resin particle. Film diffusion is rate-controlling at low concentrations and particle diffusion is rate-controlling at high concentrations. Whether film diffusion or particle diffusion is the rate- controlling mechanism, the particle size of the resin also is a determining factor. Uniform particle sized resins exhibit enhanced kinetic performance compared to conventional polydispersed resins due to the absence of kinetically slow larger beads. Stability. Strong oxidizing agents, such as nitric or chromic acid, rapidly degrade ion exchange resins. Slower degradation with oxygen and chlorine may be induced catalytically. For this reason, certain metal ions, for example, iron, manganese and copper, should be minimized in an oxidizing solution. With cation exchangers, attack is principally an the polymer backbone. Highly cross- linked cation resins have an extended useful life because of the great number of sites that must be attacked before swelling reduces the useful volume based capacity and produces unacceptable physical properties, for example, crush strength reduction and pressure drop increase. With anion exchangers, attack first occurs on the more susceptible functional groups, leading to loss of total capacity and/or conversion of strong base to weak base capacity. The limits of thermal stability are imposed by the strength of the carbon-nitrogen bond in the case of anion resins. This strength is sensitive to pH and low pH enhances stability. A temperature limitation of 60°C (140°F) is recommended for hydroxide cycle operations. Cation resin stability also is dependent on pH; the stability to hydrolysis of the carbon-sulfur bond diminishes with a lowering of pH. They are much more stable than anions however and can be operated up to 150°C (300°F). Resin Structure and Manufacture The manufacture of ion exchange resins involves the preparation of a cross-linked bead copolymer followed by sulfonation in the case of strong acid cation resins, or chloromethylation and the amination of the copolymer for anion resins. Cation Exchange Resins. Weak acid cation exchange resins are based primarily an acrylic or methacrylic acid that has been cross- linked with a di-functional monomer (usually divinylbenzene [DVB]). The manufacturing process may start with the ester of the acid in suspension polymerization followed by hydrolysis of the resulting product to produce the functional acid group. Weak acid resins have a high affinity for the hydrogen ion and are therefore easily regenerated with strong acids. The acid-regenerated resin exhibits a high capacity for the alkaline earth metals associated with alkalinity and a more limited capacity for the alkali metals with alkalinity. No significant salt splitting occurs with neutral salts. However, when the resin is not protonated (e.g., if it has been neutralized with sodium hydroxide), softening can be performed, even in the presence of a high salt background. Strong acid resins are sulfonated copolymers of styrene and DVB. These materials are characterized by their ability to exchange cations or split neutral salts and are useful across the entire pH range. Anion Exchange Resins. Weak base resins do not contain exchangeable ionic sites and function as acid adsorbers. These resins are capable of sorbing strong acids with a high capacity and are readily regenerated with caustic. They are therefore particularly effective when used in combination with a strong base anion by providing an overall high operating capacity and regeneration efficiency. Ionic Systems PC-200 Resin is tested and certified by WQA under Pure Resin Company, LTD. against NSF/ANSI 44 & 61.